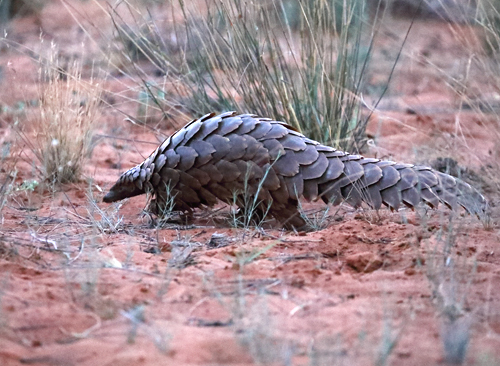 The incredibly elusive Pangolin. 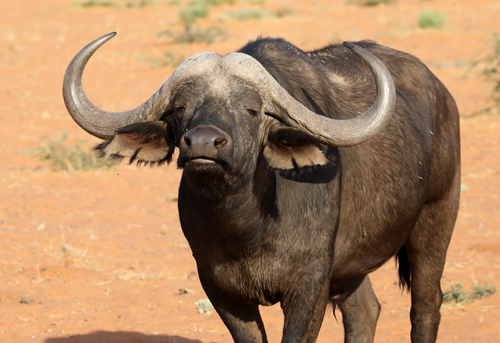 Awesome animal. 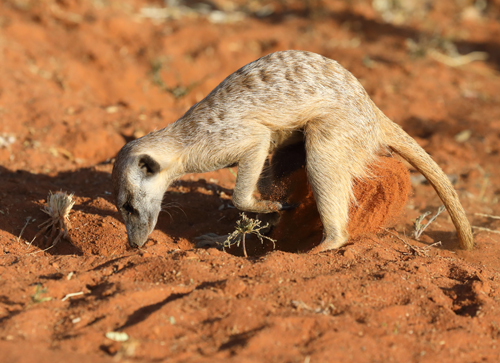 Very difficult to find indeed. 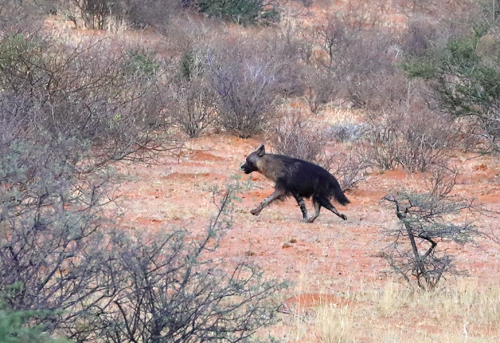 My first ever sighting. 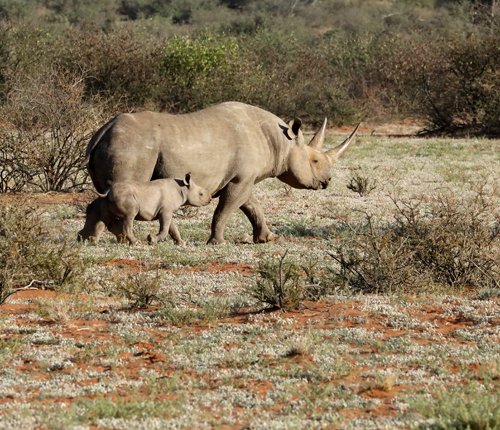 Mother and calf Hooklipped Rhinoceros. 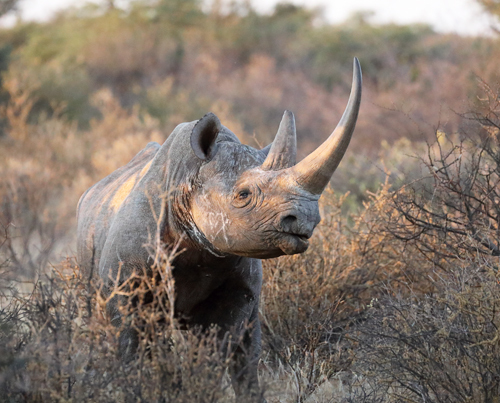 Female Hooklipped Rhinoceros. 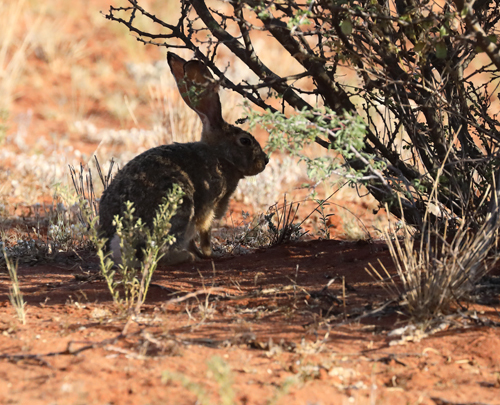 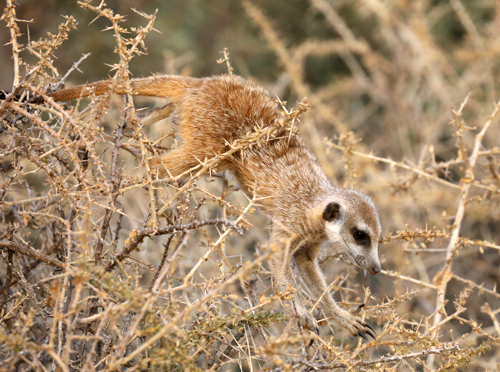 This species lives in thick bush where it feeds by browsing on trees and shrubs. 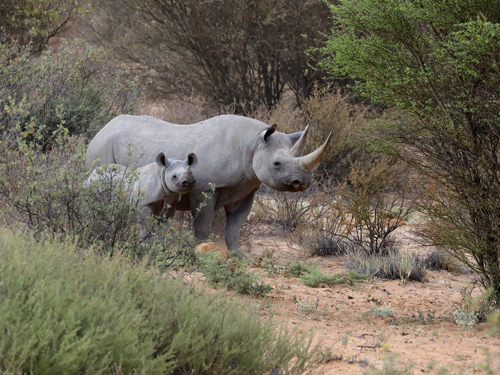 Mother and calf Hooklipped Rhinoceros (also called Black Rhinoceros). 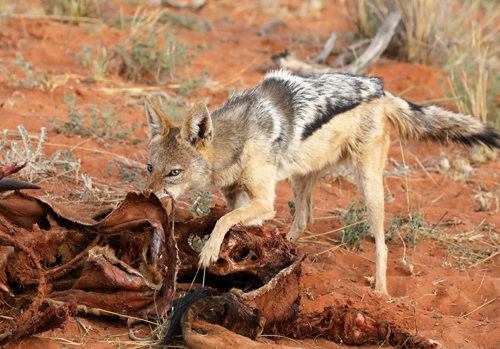 Such a rare and beautiful sighting of this oh so rare mammal. 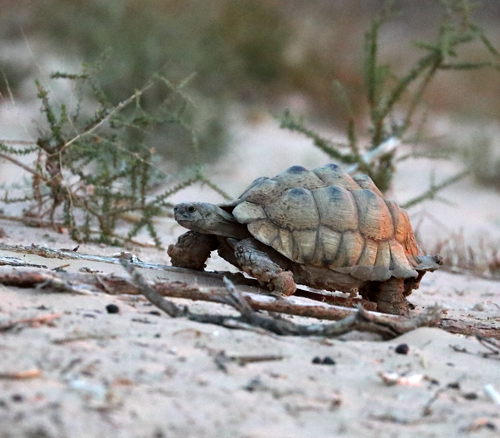 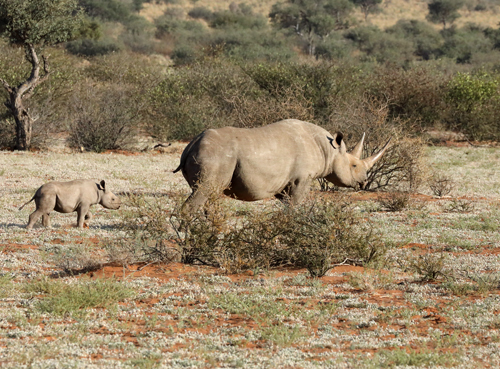 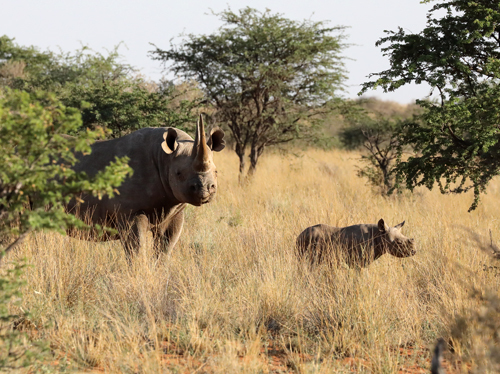 Thankfully the rhinos are doing well at Tswalu. 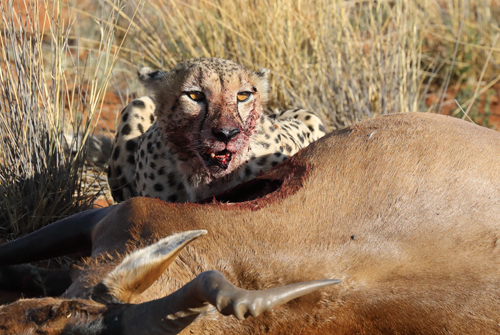 After the two Cheetah fed on their Red Hartebeest kill for two days, skin and bones were all that was left over for a passing Blackbacked Jackal. 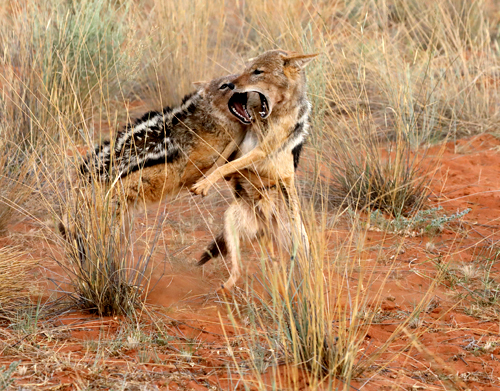 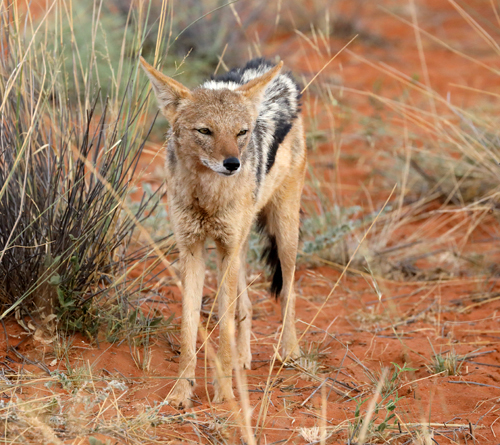 Blackbacked Jackals mostly scavenge, though they also catch small prey items or eat fruits such as tsamma melons. 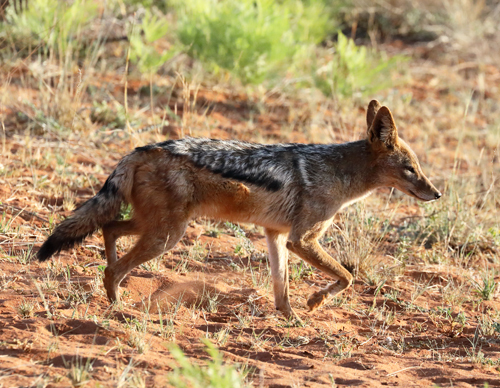 A second Blackbacked Jackal appears on the scene, very likely the mate of the first Jackal. 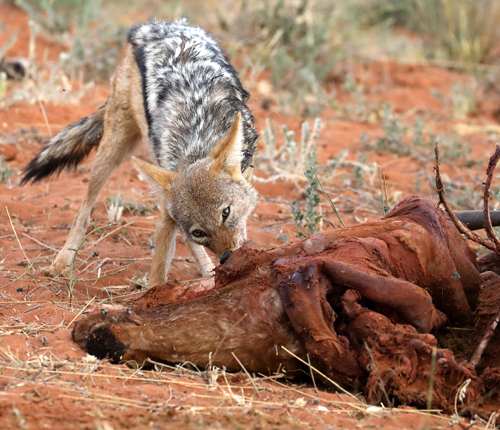 Mate or not the Jackals fight for possession of the carcase. 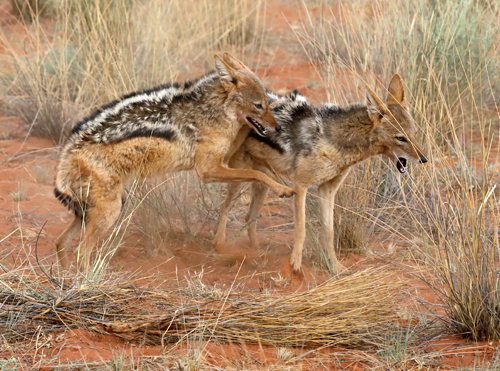 Note the raised hackles during fighting. 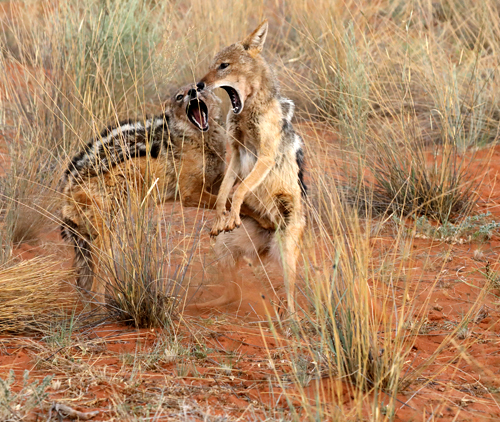 The fighting mostly consists of show rather than physical attacks. 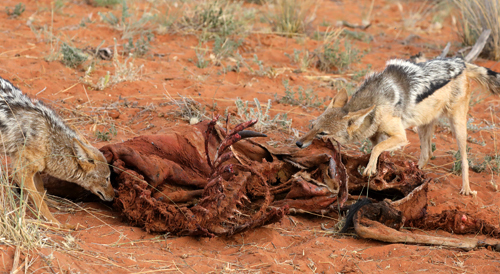 Neither animal can afford to become injured. 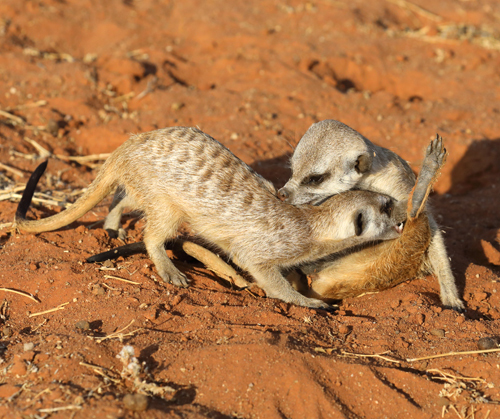 Point made, the newcomer can now feed from the carcase. 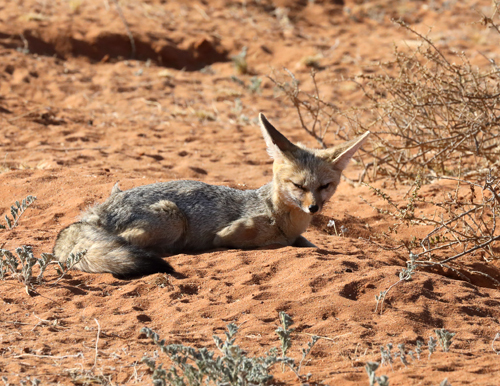 The loser looks on. 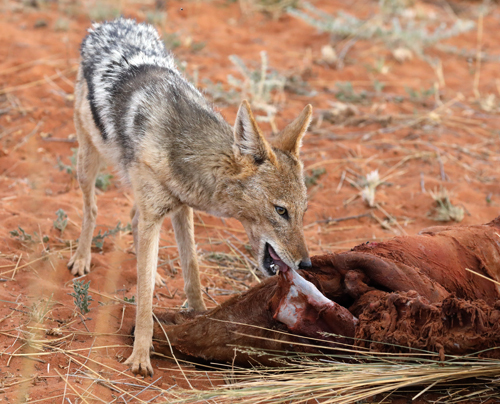 But will soon get another chance to feed. 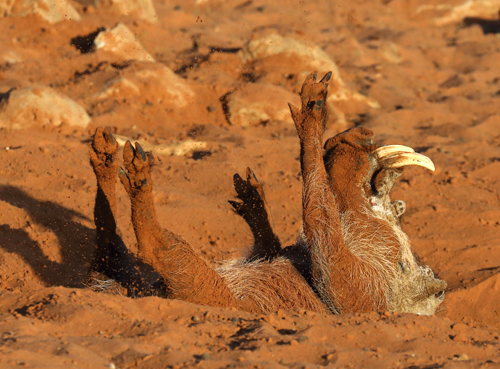 ... Just not quite yet. 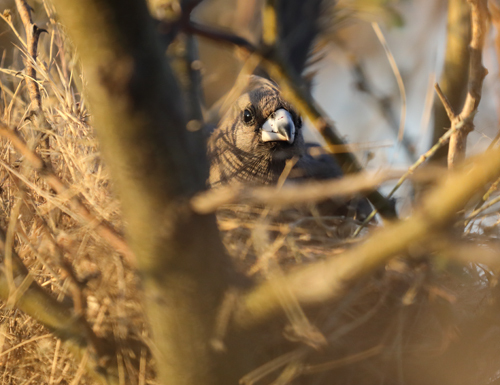 At last another chance to feed. 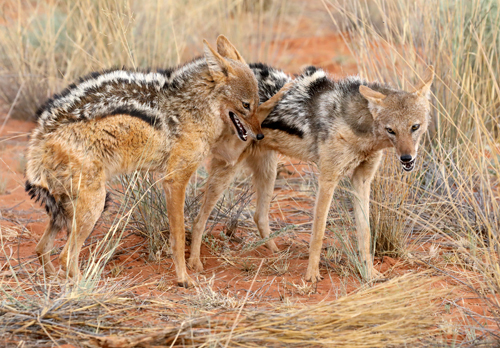 A temporary truce so that both Jackals can feed together. 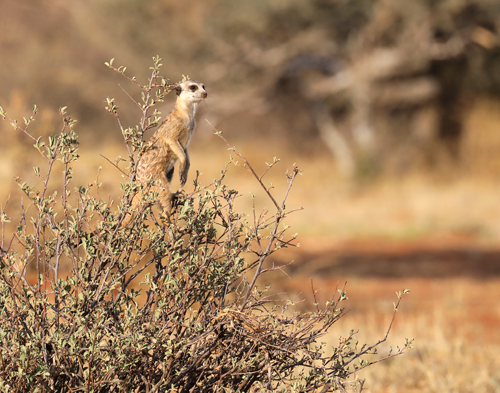 Lookout Meeerkat perched atop a shrub shortly before giving alarm call. 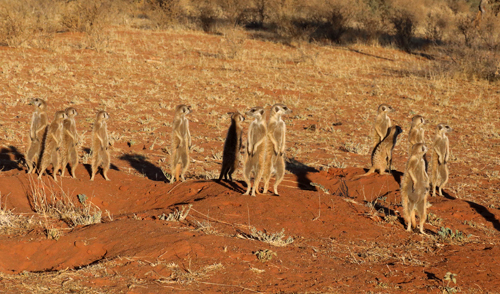 Meerkats looking towards possible predator following alarm call by the lookout Meerkat. 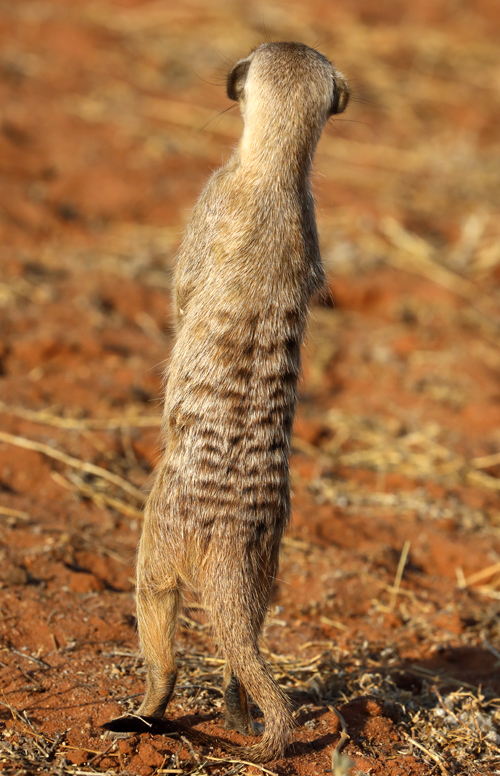 Meerkats use their tail as a prop when they stand upright. 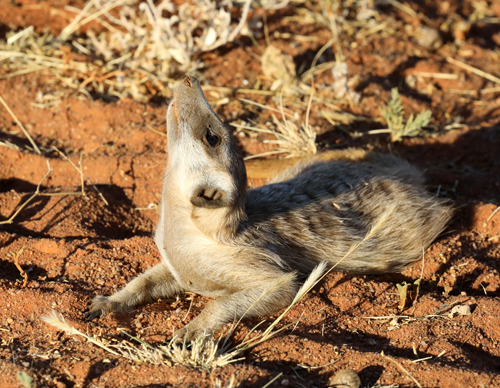 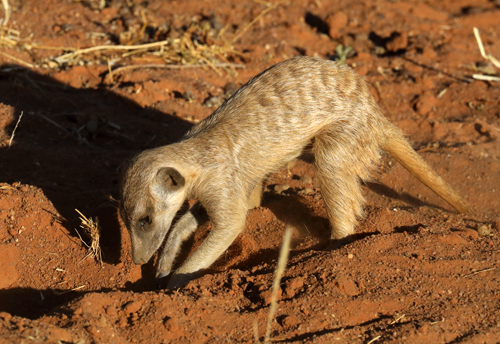 Meerkat with sand covering head after digging activity. 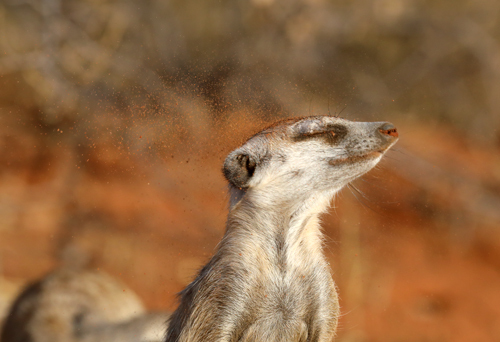 Meerkat shaking sand from his head. 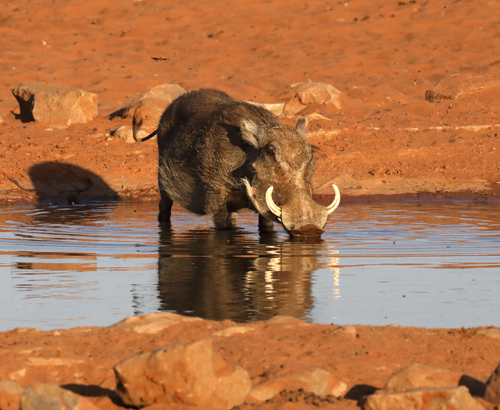 Warthog sand-bathing in hole it has just dug. 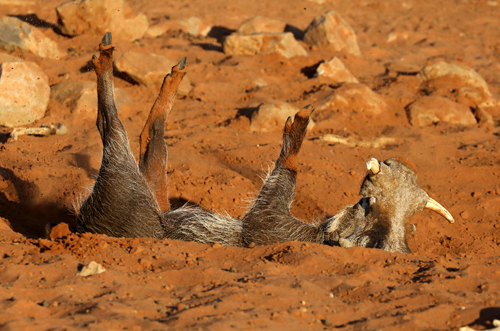 Job done ! 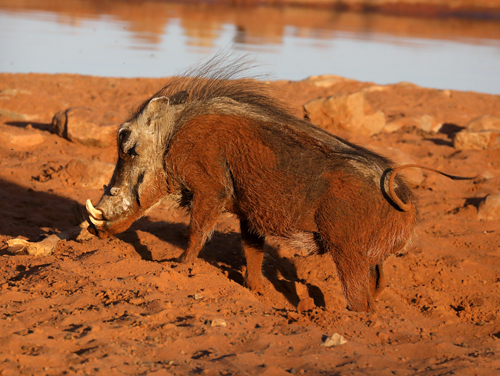 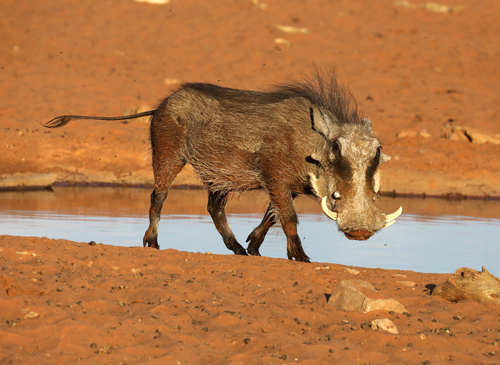 Warthog now covered in cooling sand and mud. 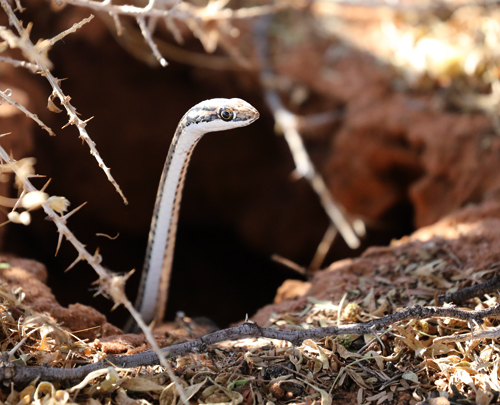 Kalahari Sand Snake peering out of a hole at base of tree. 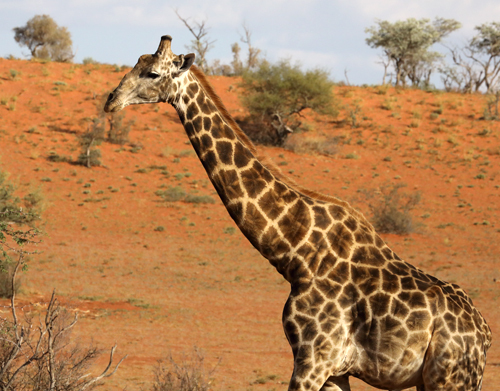 Southern African Giraffe. 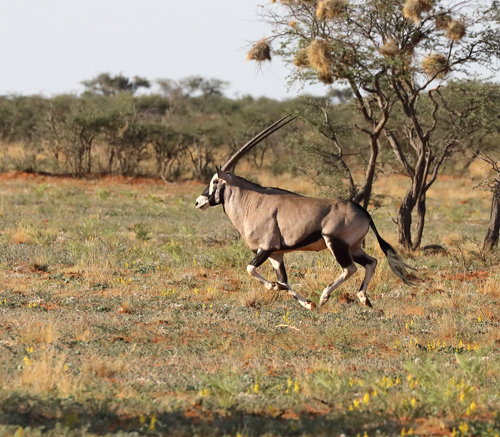 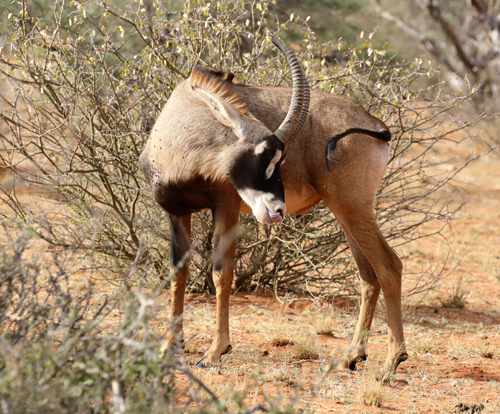 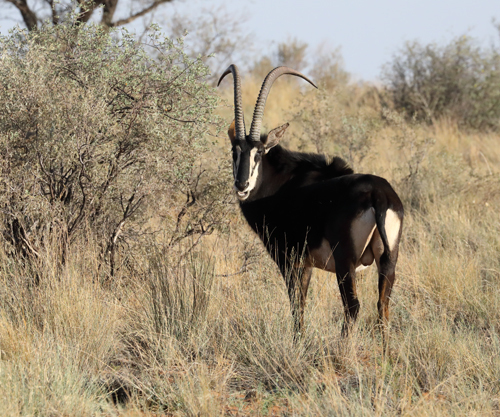 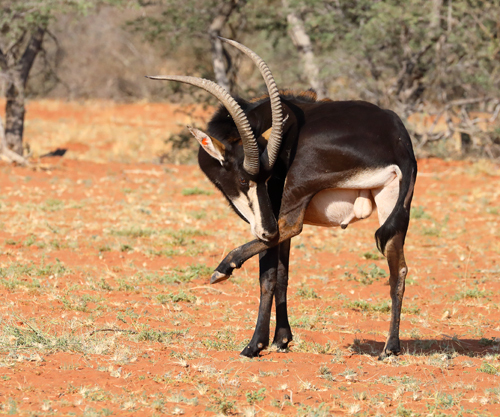 A male as indicated by the bald tops of its horns which lose their hair during fighting with other males. 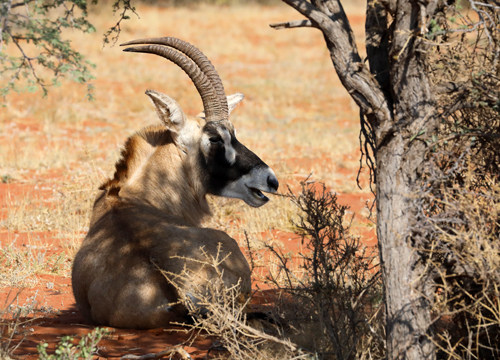 Roan Antelope resting in shade. 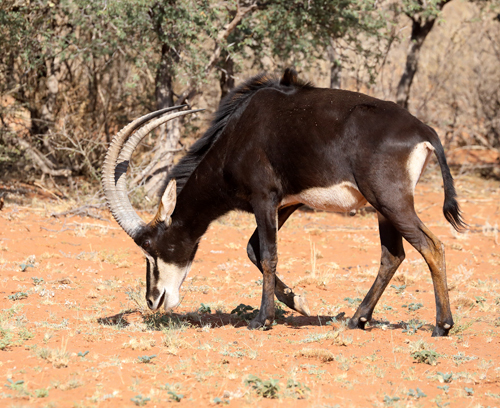 Roan Antelope. 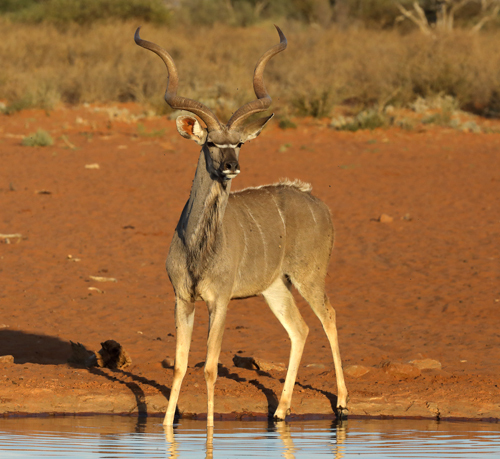 One of the largest bovids. 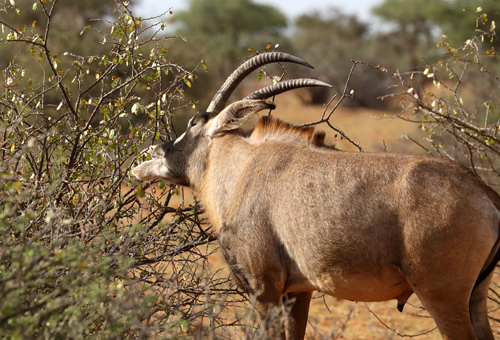 Roan Antelope browsing on tree leaves. 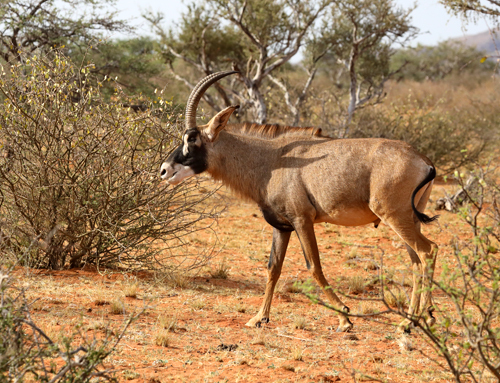 Mostly Roan are grazers, feeding on grasses. 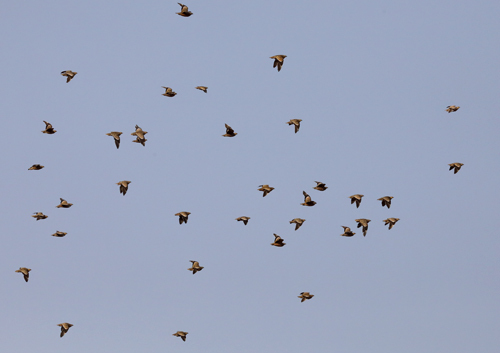 Springhare. 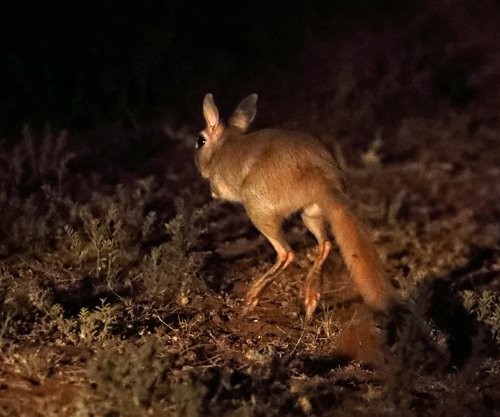 A nocturnal rodent that movesby jumping in the manner of a kangaroo. 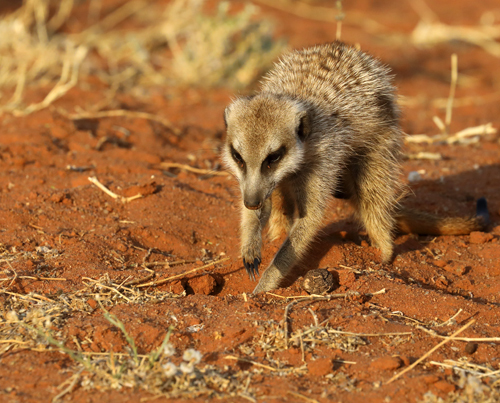 They have large hind feet and small forelegs. 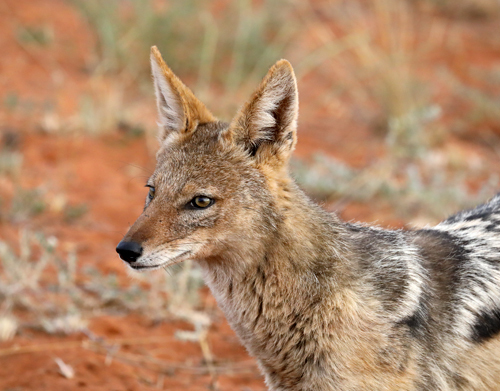 The lookout spots a Jackal and gives the appropriate alarm call. 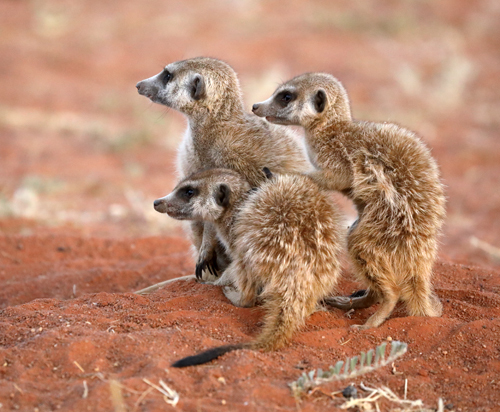 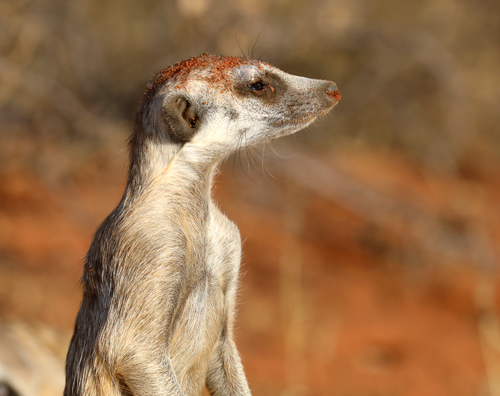 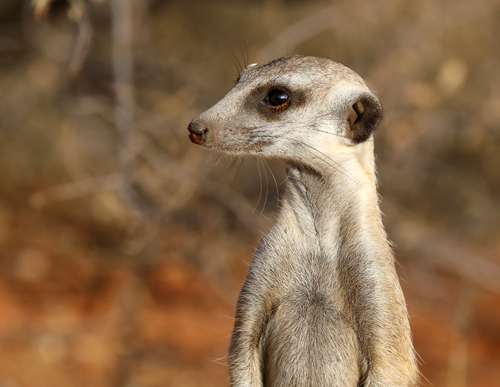 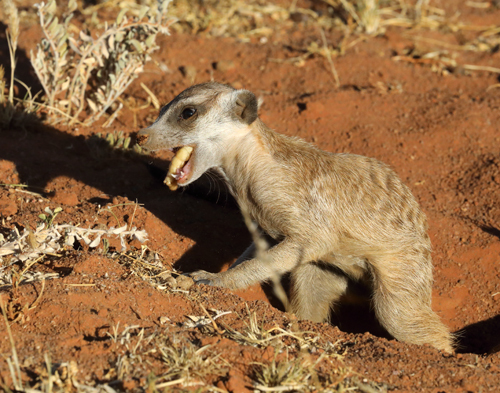 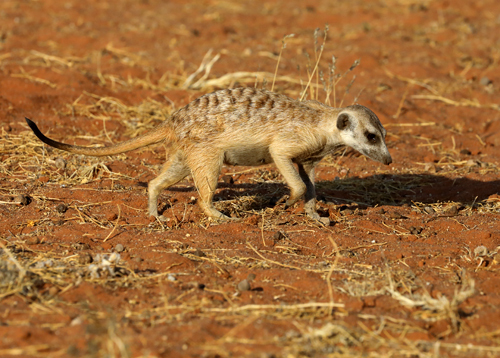 Meerkats use different alarm sounuds for different dangers. 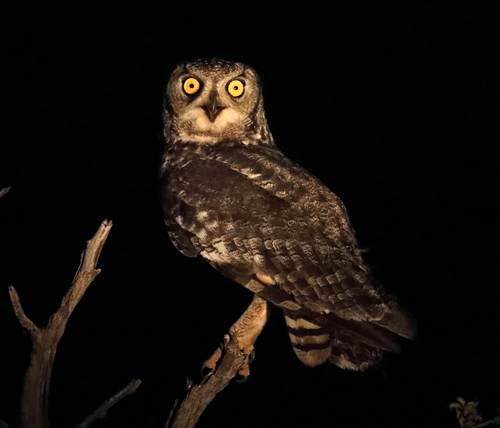 So the alarm for a bird of prey that is flying is different to that for a land mammal. 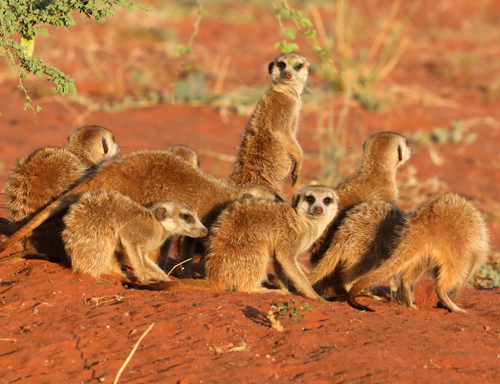 All the Meerkats in th group come back to the den site until the danger has passed. 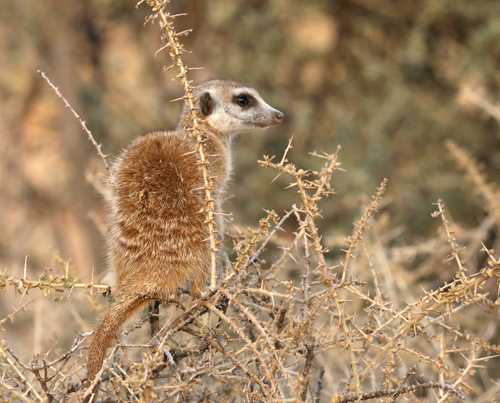 This young Meerkat spotted a Hornbill flyiong overhead and flattened its body to the ground while keeping the bird in sight. 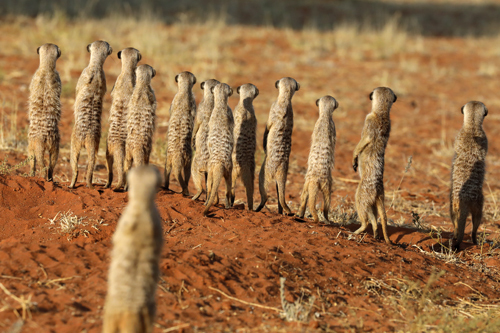 Just in case. 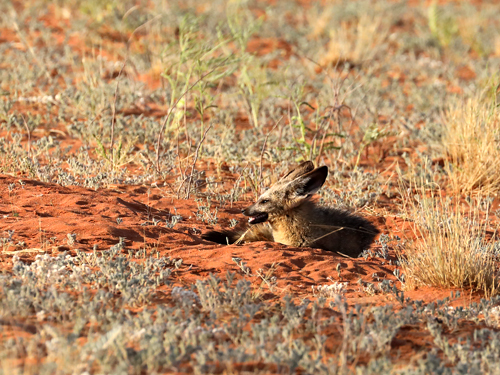 Success ! 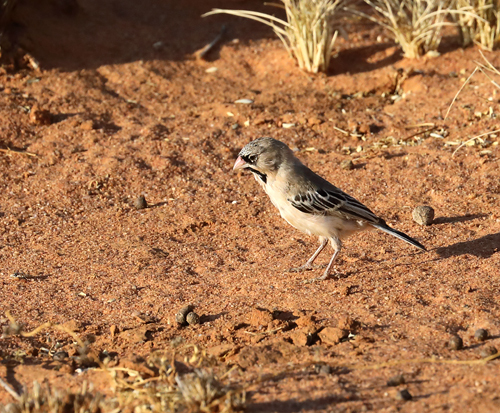 A beetle larva for breakfast. 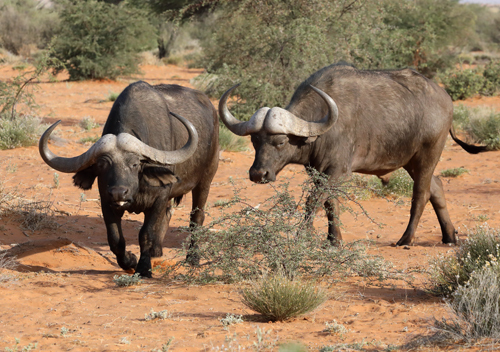 African Buaffloes at salt lick. 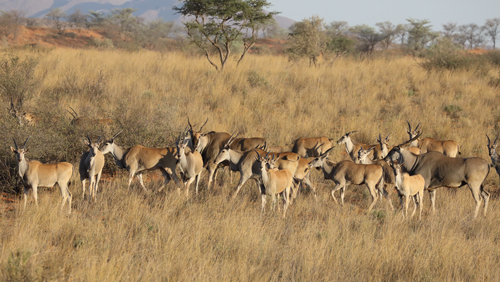 Herd of Eland, the largest antelope species. 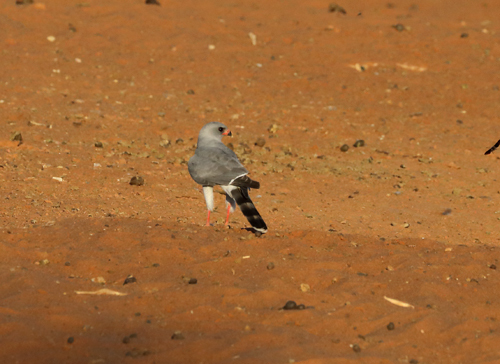 Whitebacked Mousebird sitting on its nest. 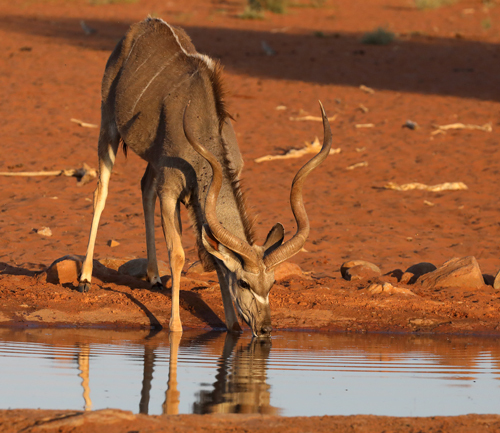 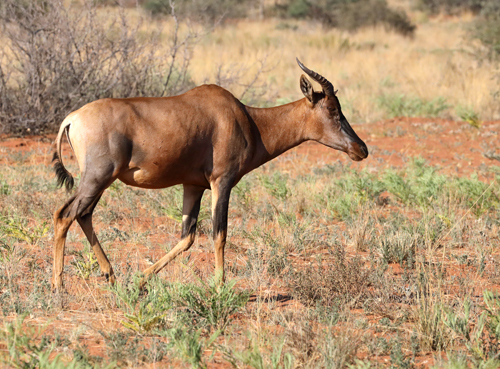 Tsessebe, one of the fastest antelope species. 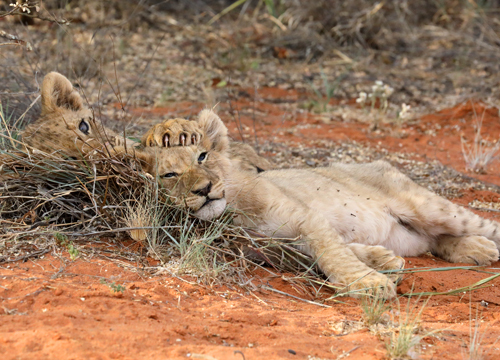 Lion cubs waiting for adults to return. 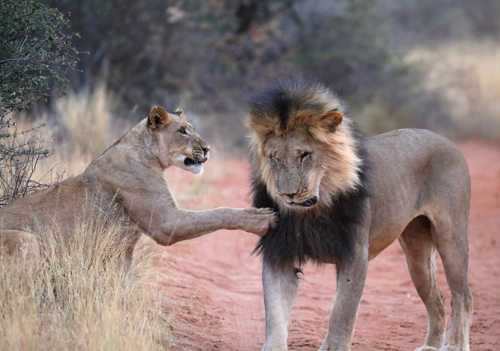 One with claws on siblings' head. 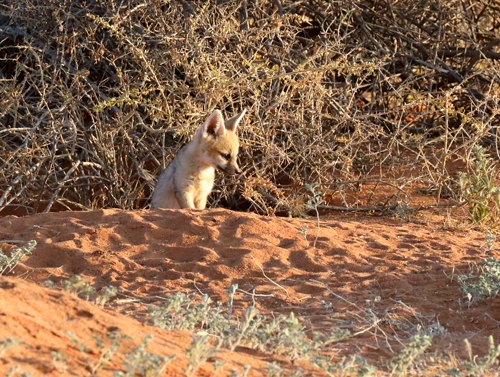 Cape Fox cub sitting in front of den site in clump of shrubs. 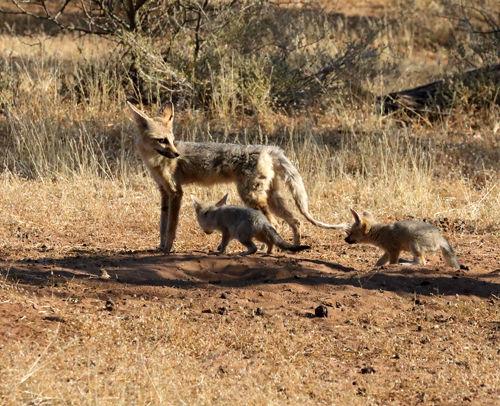 Adult Cape Fox and two cubs. 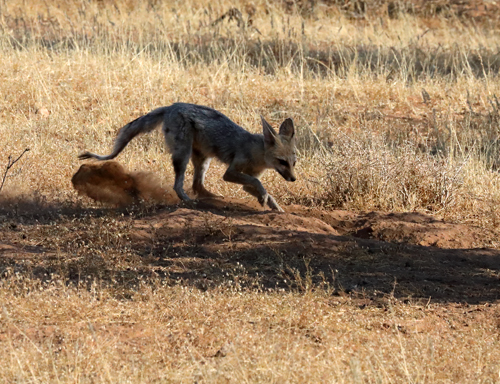 Adult Cape Fox digging at edge of den site. 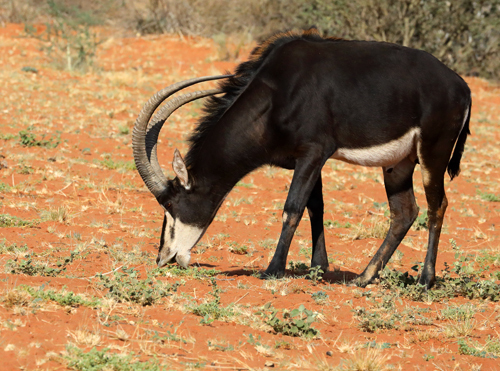 Sable Antelope grooming hind leg. 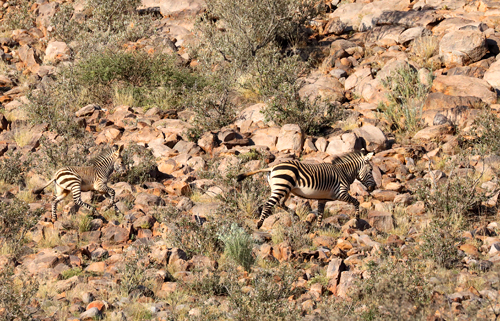 Adult and calf Hartmann's Mountain Zebra. 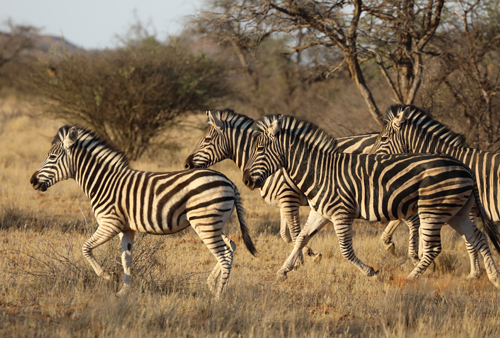 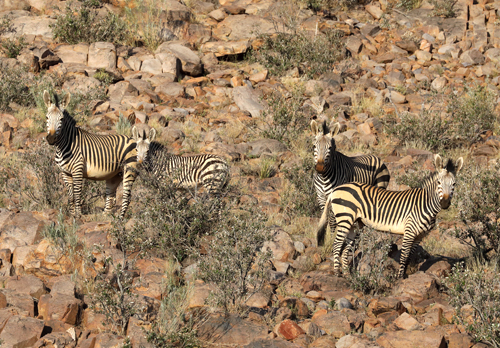 Group of Hartmann's Mountain Zebras. 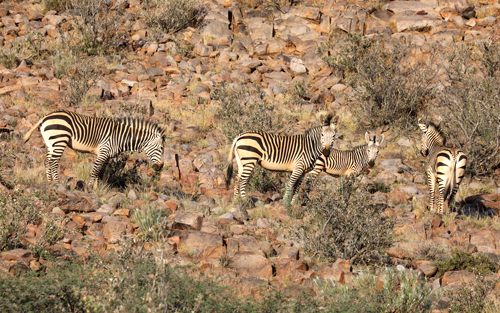 Hartmann's Mountain Zebras with calf. 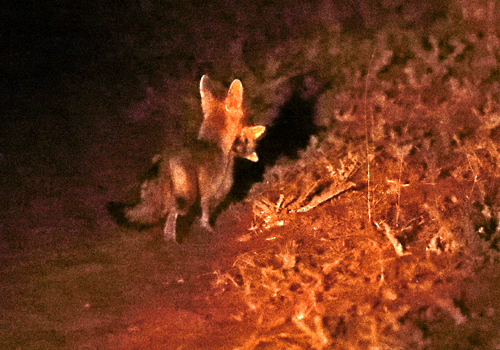 Bateared Fox at burrow entrance. 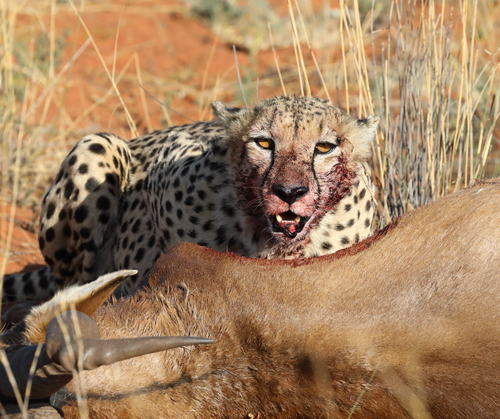 Male Cheetah with Red Hartebeest kill. 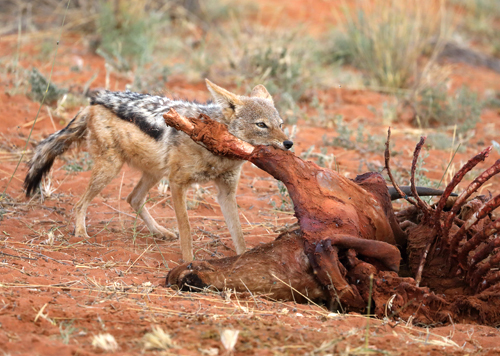 Two brothers with prey. 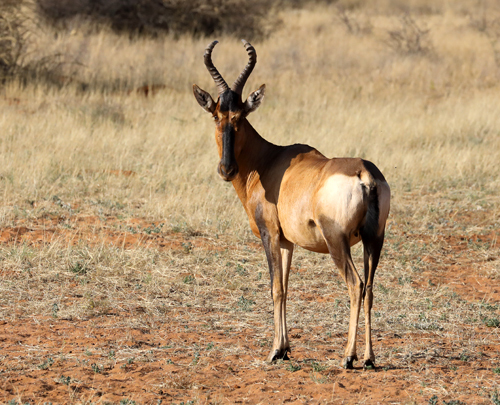 By working together in a 'coalition' the two siblings are able to bring down large prey species such as this Red Hartebeest. 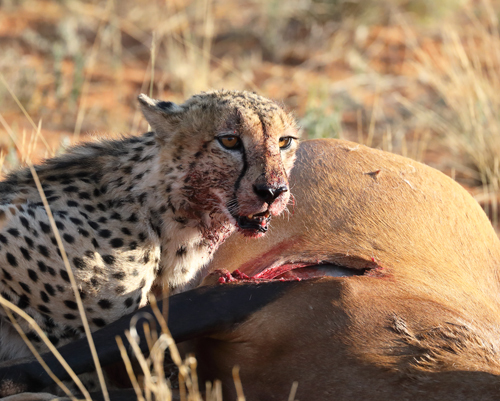 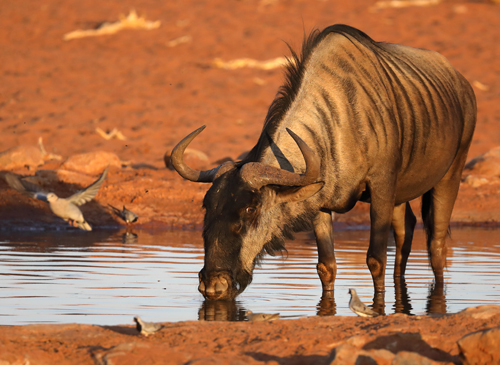 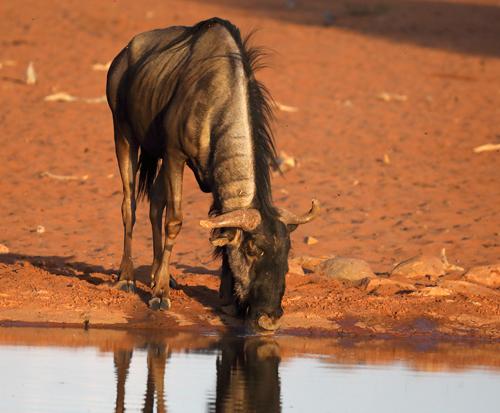 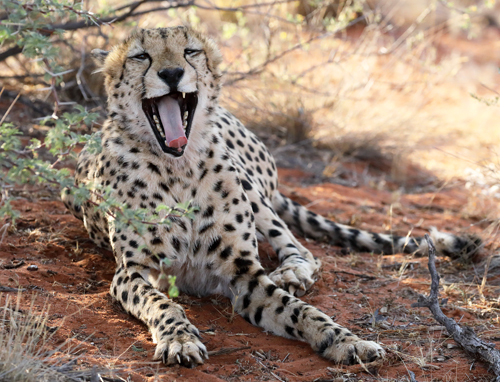 As there are no lions or spotted hyaenas in this part of Tswalu, Cheetah will gorge themselves for a day or two until they have eaten the whole carcase. 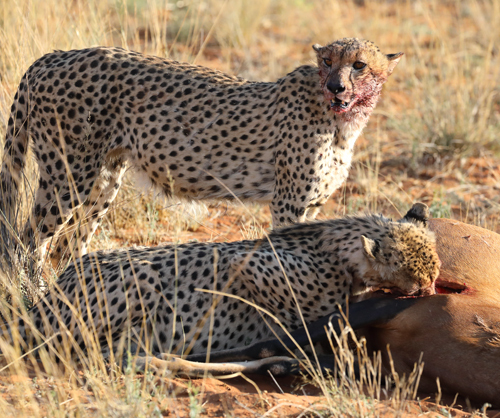 The two Cheetah will either take turns feeding or, occasionally, eat at the same time. 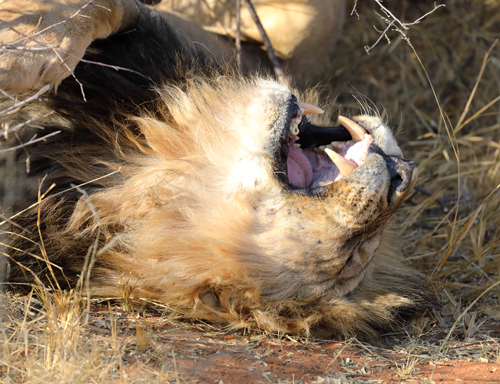 Male Lion yawning while dozing upside down. 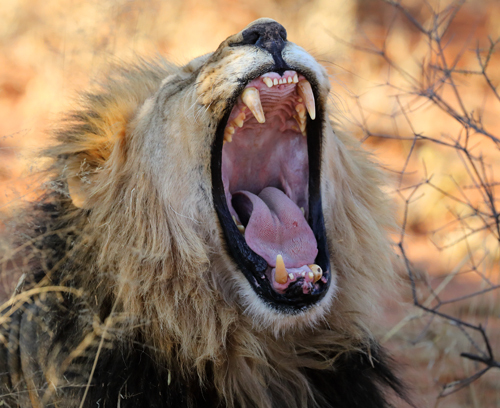 Male Lion yawning. 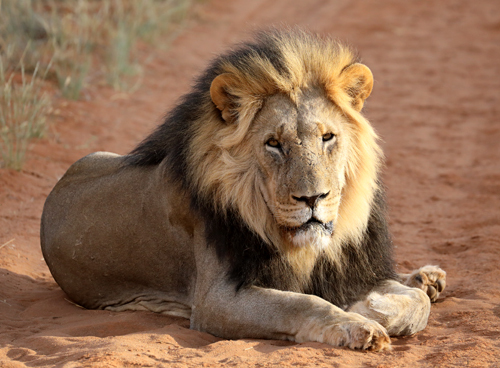 This lion, together with his brother, move between two prides of lionesses, cubs and immatures. 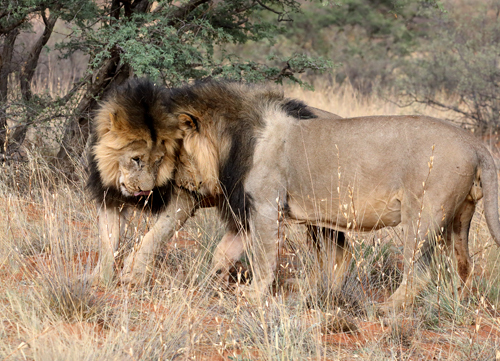 Subadult Lions moving quickly away from approaching dominant male. 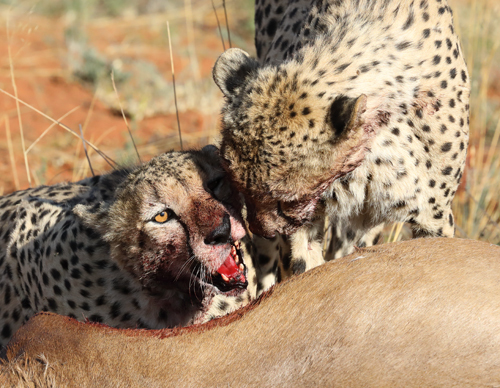 Eventually the male and his brother with chase off any young males from the pride. 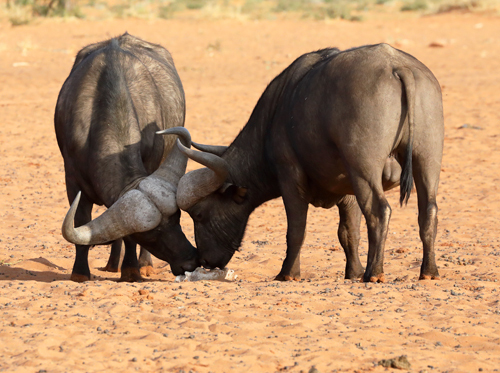 The immature males are keen not to confront the mature male as he can be a threat to them. 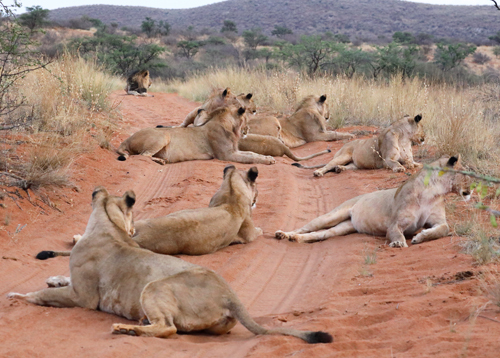 Highly social animals, lions often interact with other pride members. 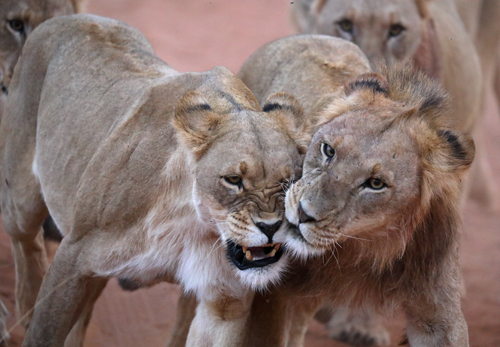 Lioness fending off male Lion. 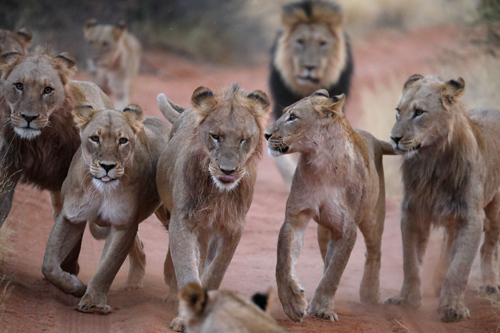 Something in the distance attracts the interest of the whole pride. 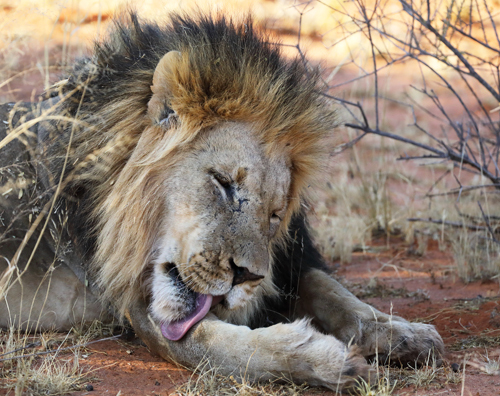 Male Lion at the peak of his powers. 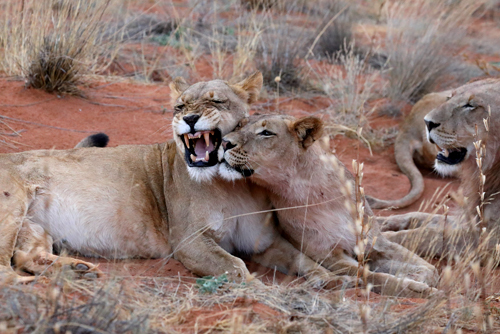 The two dominant male Lions, siblings, greet each other as the second one rejoins the pride. 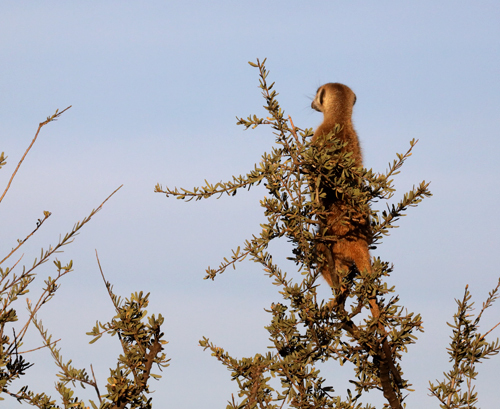 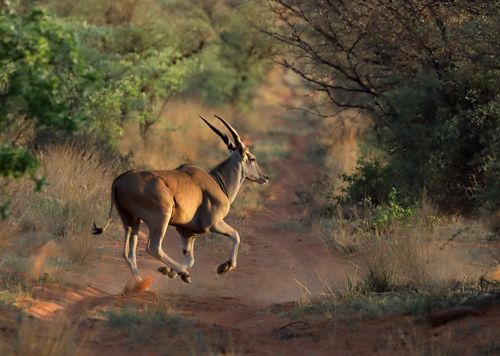 Between them they visit two different prides on the reserve. 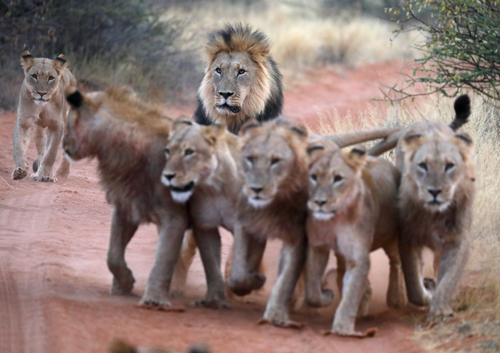 Duty done. 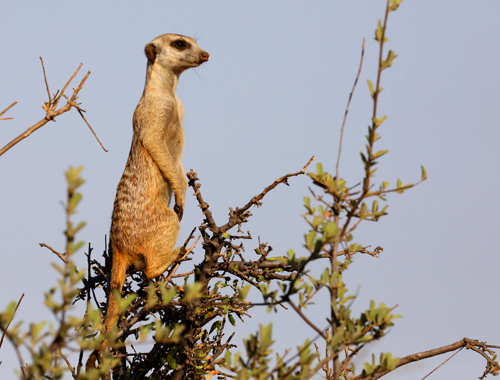 Time for another Meerkat to take over sentry duty. 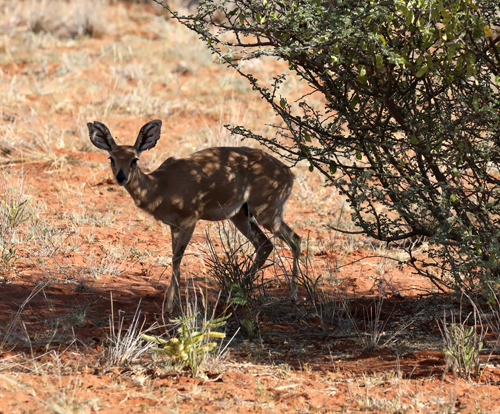 Female Steenbok stood in shade. 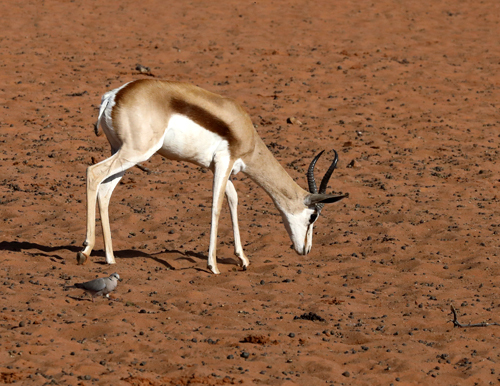 Bokmakierie. 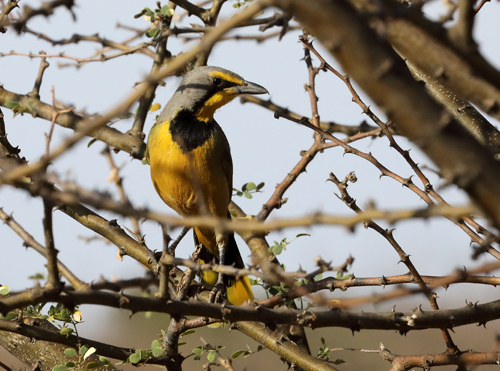 A species of bush-shrike. 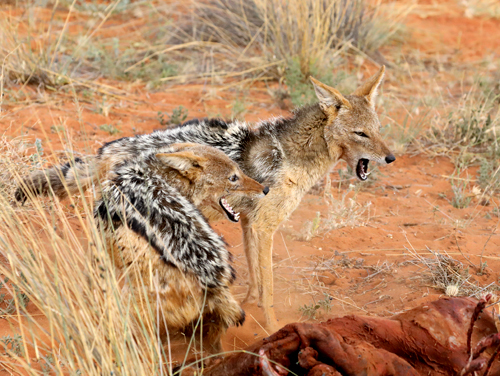 Cape Fox carrying a cub in its mouth. 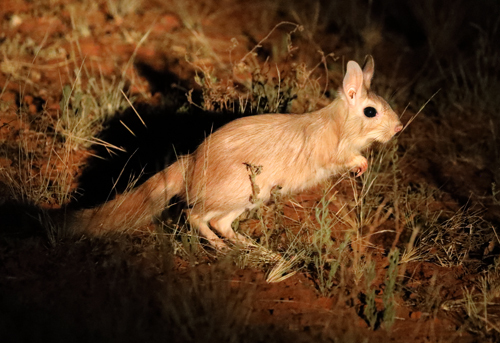 Photographed in very low light. 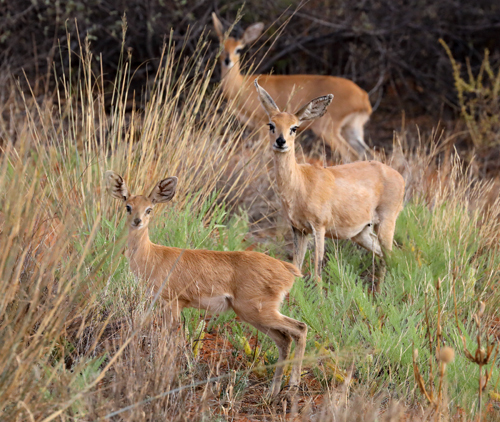 Male, Female and Baby Steenboks. 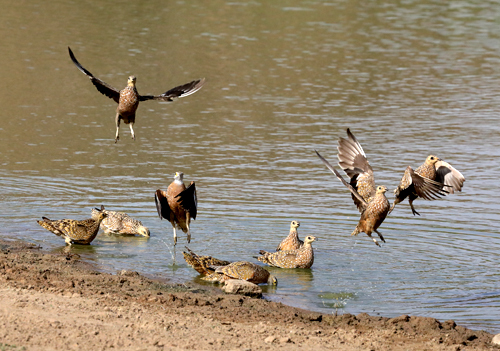 Flock of Burchell's Sandgrouse landing at waterhole. 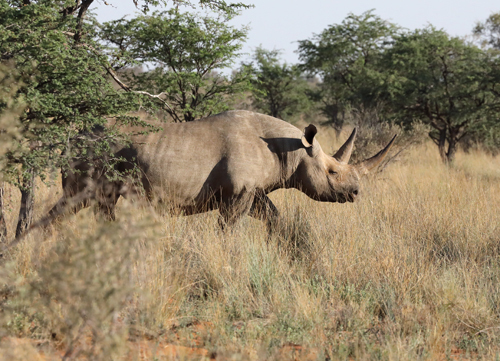 With many thanks to ranger and tracker Kosie and Siphiwe.